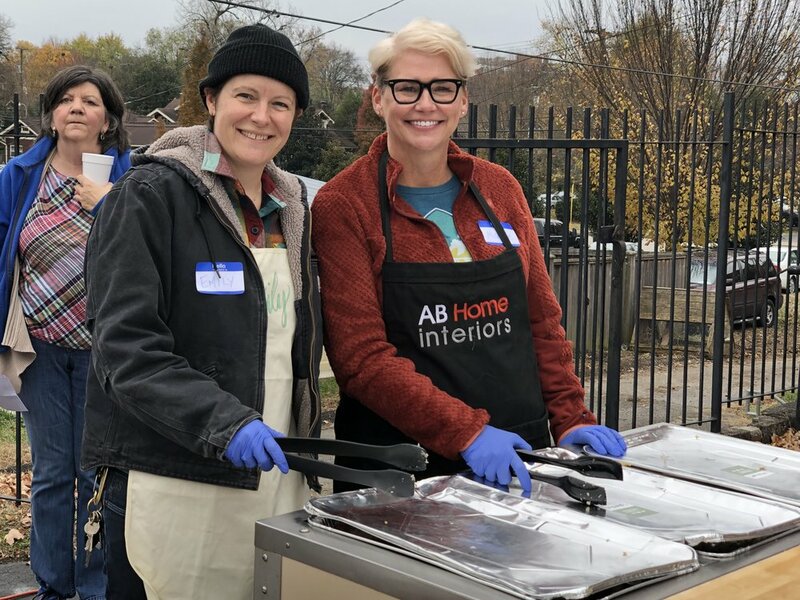 Last Monday, The Nashville Food Project was excited to participate in a new event held in Nashville this year: Gratefull, a city-wide Thanksgiving potluck. Many Americans celebrate Thanksgiving as a time for reflection and gratitude, shared with loved ones over a meal. At TNFP, we have experienced firsthand that sharing a meal has a powerful effect on each of us. Gratefull, through the support of sponsors, community volunteers, and one long table, is a shared meal intentionally designed as an agenda-free platform to unite neighbors within divided communities over something we all share, food. This idea sparked our interest as a beautiful example of the vibrant community food system that we work towards every day. The history of Gratefull is worth including here! The original event was held in Chattanooga, and is shared below as they describe on their website. “Originally called One Table, this event [Gratefull] was born from a desire to unite different groups of people in Chattanooga, Tennessee. In 2014 the staff of Causeway, a local nonprofit, were walking to lunch discussing the invisible wall that stood on Martin Luther King Boulevard, dividing two of the city’s green spaces. One was known as a popular venue for outdoor concerts and played a key role in Chattanooga’s startup culture. The other was known as a place for people experiencing homelessness, or who lived in the nearby public housing unit. They decided to invite both sides, and the broader groups that they represented, to share a meal at one table in the middle of that dividing line. You can also read more here in an article written about the event by The Washington Post. The Gratefull: Nashville event was held outside of the Edgefield Baptist Church on Russell St. in East Nashville. Together, a group of incredible volunteers gathered to set up the event, serve the food, and clean up. While community members ate, they were serenaded by Terrell Hunt, The Cumberland Bend, and the Warner Elementary School Choir. Of course, the highlight was the many tables groaning under mountains of delicious food. Just a few of the local businesses and restaurants who donated food included Margot’s, Marche, Martin’s BBQ, Taco Mamacita, EastLeigh Desserts, and Butcher and Bee. Many neighbors and friends also brought their favorite Thanksgiving dishes to share. I was lucky enough to get to enjoy this meal with a friend. We filled our plates and went to sit down, deeply engrossed in a conversation about our tips and tricks for a perfect Thanksgiving gravy. Before we knew it, others began to chime in, all sharing their own stories and tips for a great holiday gravy. This is the power of food, that with a shared meal inherently comes community and new friends. To me, making friends this way comes easily - when we are comfortable and well-nourished, enjoying a warm bowl of soup on a cold day or a slice of pie.